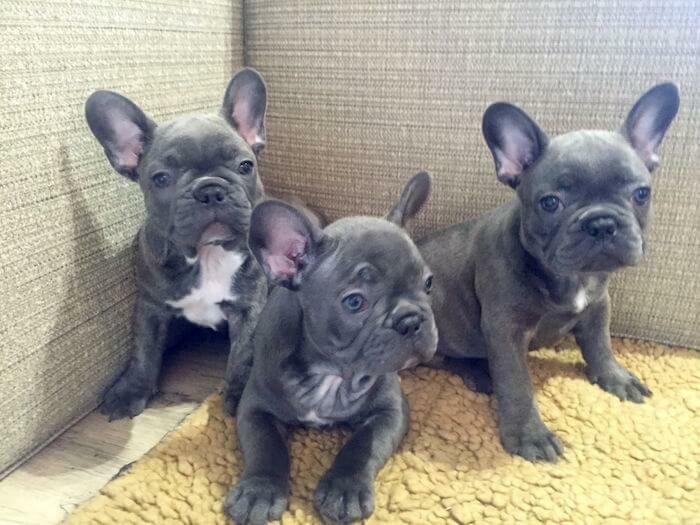 Are you looking to add a Blue French Bulldog to your family? Blue French Bulldogs are a variation that you get in the French Bulldog breed and are not a breed of their own. They do have a few things that are a bit different than the normal French Bulldogs. In this blog post, I will be going through the personality, temperament, training, etc. of the Blue French Bulldog in as much detail as possible so that you have all the information that you need before you get yourself one of these furry munchkins! So, without any further delays, let’s begin this blog post. French Bulldogs, affectionately known as Frenchies are small dogs. These cute little munchkins are a result of a cross between the English Bulldog ancestors and Parisian local ratters. This dog breed is the fourth most popular breed in the United Kingdom and the sixth most popular breed in America. This breed’s ancestors were used for blood sports such as bull and bear baiting but, after the illegalization, they were left ‘jobless’. In the 1800s bulldogs began being bred as companion dogs and were crossed with several other breeds to make designer dogs. These dogs quickly gained popularity in all of Europe including France. And, that’s how the French Bulldog came to be. The Blue French Bulldog has a genetic mutation which is responsible for the unique coloring, making it more rare and expensive. It is true that some dog shows don’t let Blue French Bulldogs participate in them because of their unique coloring. These dogs aren’t recognized by dog breeder associations. It is true that they are not a separate breed on their own but, you won’t be able to enter your Blue French Bulldogs in most dog shows they aren’t white, brindle, or fawn in color. A Frenchie with blue fur is not considered a pure French Bulldog. However, this should only concern if you if you’d want your dog to compete. If you want to buy a French Bulldog to just be as a pet, then, this isn’t something that should be a problem for you at all. There is no reason to think that the Blue Frenchie is not a purebred. Experts suggest that the unique coloring of the Blue Frenchie os due to a condition called blue dog alopecia, that is, discoloration. In this section of the blog, I would like to share a few temperament as well as personality traits of the Blue French Bulldog with you. This is something that a potential dog owner needs to know to understand what they are getting into as the compatibility between the owner and the dog is really important for both of you to have a quality life. The Blue French Bulldog, like the regular Frenchie, is a playful and lively little munchkin. I’m not lying when I say that these guys light up any room that they enter! These doggies love to seek attention and play around with other humans and pets! These doggies also enjoy a game of fetch or tug of war. So, be sure to play, play, play! Blue French Bulldogs aren’t afraid of showing you affection. These dogs love to love you and lick you all the time. They will always let you know that they are there for you. These dogs are highly emotionally intelligent and know how to cheer you up when you’re feeling sad. All they need is some love in return! They so get sad if their love isn’t reciprocated. So, make sure you love them and pet them! If you lead a moderately active lifestyle then, this dog is for you! Blue French Bulldogs are known to be kind of lazy dogs that are perfectly fine with leading an inactive lifestyle. They love to lounge in the house and do nothing at all! They’ll provide you with some company on the lazy Sunday morning. These dogs are very easygoing and like to ‘chill’. However, these dogs still need their exercise! Blue French Bulldogs are patient little fellows that let you take your time. Some dog breeds are known to be quite impatient which can be quite distressing for their owners. Good thing that these dogs are of an easygoing and patient nature. Some dogs are just single-owner dogs that aren’t too friendly. The Blue French Bulldog is very social. This dog goes along really well with other dogs as well as people and likes to entertain guests. They make friends quite easily and are good with kids, too. Be sure to socialize your puppy at the right time for him to show his true personality to the world! I did mention that blue French Bulldogs were lazy and they are. That doesn’t mean that they can’t be athletic, too! French Bulldogs, as a breed, are known to be quite muscular and require high amounts of protein and regular exercise to maintain their awesome physique. Blue French Bulldogs are family dogs. They do really well in a family as it is their ‘pack’ and are very protective of their loved ones. They go along well with kids as well! But, with small kids, you always want to monitor their interactions as one party can easily harm the other during playtime. Blue French Bulldog Price: How Expensive Is This Doggy? Blue French bulldogs are quite rare which makes them popular, and sell for a premium. There aren’t any big differences between the Blue French Bulldog and the regular Frenchie—except the coloring. But, the Blue doggie sells more as much as twice the price of the regular one! The thing is that the Blue French Bulldogs are very rare. So, not only will a Blue French Bulldog be harder to find, it will also cost a lot as breeders try to capitalize on the rarity of this dog. One thing that the potential owner of a Blue French Bulldog should know is that these dogs suffer from some serious health issues. 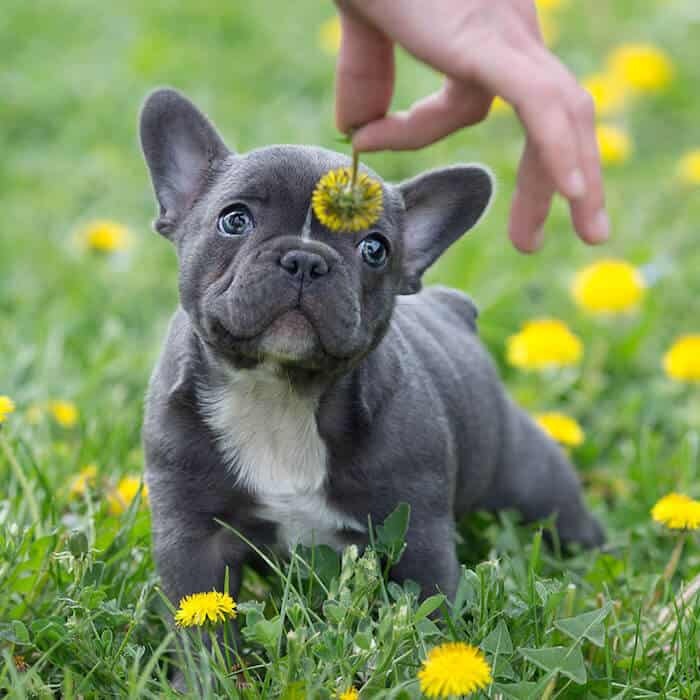 The exact connection between these health issues and the color of the dog’s coat is still unclear but, blue French Bulldogs are known to be allergic to a lot of different things. These dogs also suffer from neck and back issues due to their short build. Also, they get injured rather easily. You will have to visit the vet quite frequently with these doggies. If you already own a dog, you know how important it is for you to know these things! If you’re hypoallergenic then, getting a dog who sheds a lot won’t be a good idea for you! And, if you lead a hectic lifestyle, getting a high-maintenance dog won’t help. In this section, I’ll go through the grooming, bathing, and other needs of the Blue French Bulldogs. So, keep reading to know more! Yes, Blue French Bulldogs are lazy dogs but, they need exercise as well to maintain their physique. The thing is that French Bulldogs can easily gain weight and get obese if they don’t get adequate physical activity. Lack of exercise can also cause other major problems later in life. So, get a good French Bulldog harness and take your dog out for a walk! The good thing is that Blue French Bulldogs have a short coat, which means that they don’t need a lot of grooming. With French Bulldogs, all you need to do is brush them thoroughly once and week. You can also wash these dogs as needed. But, you won’t have to take your Blue French Bulldogs to the groomers on a regular basis. Another great thing about Blue French Bulldogs is that they don’t shed as much as a regular dog would. As I mentioned before, Frenchies have a short coat. These dogs shed moderately when the season changes. So, that’s about twice a year which is manageable. One thing that bothers the Blue French Bulldogs quite a lot are the long nails. Your dog can accidentally hurt you with his long nails and run around with them can also be painful for the doggy. You can trim your Frenchie’s nails but, I recommend you to use a nail grinder which is less painful and easier to use. The Unique Health Problems That French Bulldogs Face! Blue French Bulldogs face a few medical issues that are unique to them. In this blog section, I would like to share them with you. Skin allergies and reactions to cleaning product, shampoos, etc. You need to give your Frenchie a special ingredient diet and call the vet immediately if your dog has puffy eyes, rashes, or other symptoms. With this dog, you will have to visit the vet more frequently. The connection between the color of the coat and proneness to disease isn’t clear yet but, it has to do with the genes of this doggy. Summing Up: The Blue French Dog! 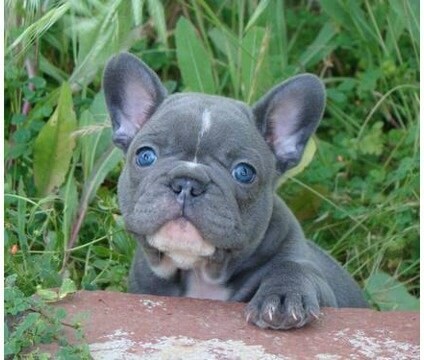 The Blue French Bulldog is a color variation that you find in your regular Frenchie. However, this color is not officially recognized by dog breed associations and may not even be allowed to compete in dog shows. This dog is not a different breed. The temperamental traits, personality characteristics, etc. of this dog breed are similar to those of the regular Frenchie. The Blue French Bulldogs are more prone to allergies due to reasons unknown. Still, have any doubts that you would want me to clear? Leave them in the comments and we will get back to you!